In the world of complicated watches, the Grand Complications by Patek Philippe undoubtedly occupy a special position. 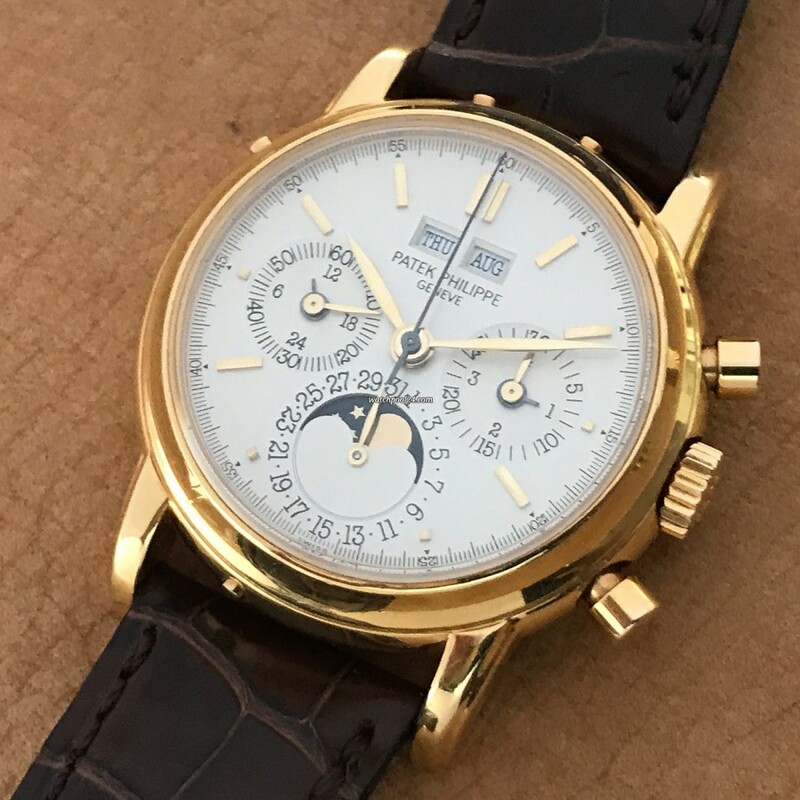 And here we offer you a truly classic: Patek Philippe Grand Complications 3970 - perpetual calendar, moon phase and chronograph in a yellow gold case. The reference 3970 was introduced in 1986 and is the successor to the legendary reference 2499. The silver dial with three sub-registers and two apertures at 12 o'clock is perfectly balanced. The 36 mm yellow gold case, along with the silver dial, give the watch a warm, elegant look. The reference 3970 exists in 4 executions, the main differences being in the aesthetics and in the number of production items. This particular example is the second series produced in the short period between 1986 and 1991. About 650 examples were made in yellow, rose and white gold. For the first time the customers had an option to order a sapphire case back in addition to the solid caseback. Furthermore the second execution was the last one with the beautiful feuille hands, before the baton hands were instroduced. Today, the first and second series of the reference 3970 is considered as one of the most sought after collector's watches in the world. This particular Patek Philippe 3970 is from 1991 and comes with an ultra full set. It includes the certificate of origin, the original box, an additional sapphire crystal caseback, setting pin and informative original booklets and brochures by Patek Philippe. The watch has been superbly preserved, the case shows only a few signs of usage and is unpolished. The dial is absolutely flawless. The heart of this watch is the extremely complex in-house manual wound caliber CH 27-70 Q. All functions and complications have been checked and run perfectly. This Patek is accompanied by the original Patek Philippe crocodile strap. The reference 3970 is no longer produced today. Among the Patek Philippe collectors, this model enjoys a cult status. This perpetual calendar chronograph offers a stunning design, complicated movement and the highest quality of watchmaking. Check out this interesting article by HODINKEE, which provides detailed informations about the Patek Philippe 3970.